IRVINE, Calif., January 4, 2017 – XUMO, the premier LIVE and video-on-demand (VOD) over-the-top (OTT) service for the digital age, is teaming up with Hisense, a multinational consumer technology manufacturer and one of the largest television brands in the world, to offer 60 free ad-supported channels via a designated XUMO virtual input selection on new 2016 and 2017 Hisense and Sharp smart TVs in the US. As television consumers are overwhelmed with costly monthly subscriptions, they are actively looking for quick, easy ways to access content. In addition to the lineup of premium XUMO digital content, Hisense and Sharp smart TV owners will be able to enjoy the ‘last channel experience’ smart TV owners have previously appreciated with traditional cable. XUMO users who ended their session on a channel powered by XUMO will now be able to turn on their smart TV and pick up where they left off with no interruption—no need to switch inputs or search for the channel or video they were enjoying during their last sitting. 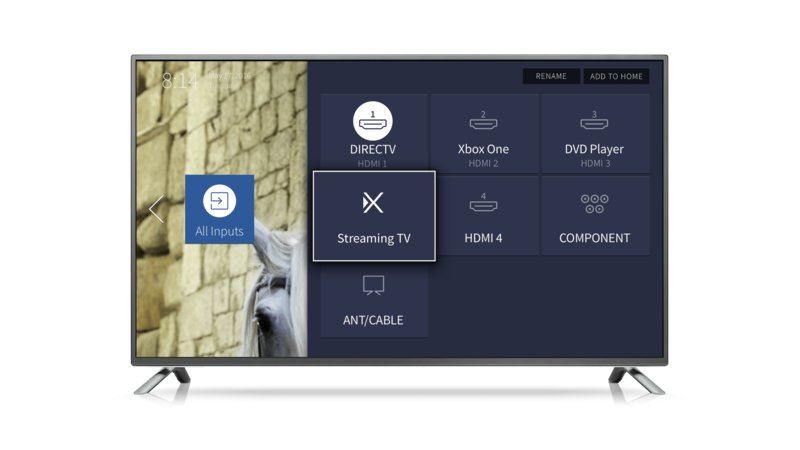 XUMO’s native integration also permits the user to search for channels by inputting specific channel numbers on the remote control or by quickly selecting +/- to surf the channels available—a preferred method of new channel discovery. XUMO’s content is able to directly reach new TV audiences through XUMO’s innovative product and platform, as it prioritizes the user’s choice to select content they actually want to watch. This simple, intuitive experience allows for increased discovery and engagement. XUMO has built an impressive list of over 70 content partners with both live and on-demand options available on XUMO’s various platform across smart TVs, iOS and Android devices and Roku. XUMO will be exhibiting at CES, January 5-8, 2017, at the ARIA Sky Suites. To learn more about its premium, digital content or how to become a partner, please visit https://www.xumo.com/. About Hisense USA Corporation and Hisense Company, Ltd.
Hisense USA Corporation is a subsidiary of the Hisense Company, Ltd., established in 1969 and headquartered in Qingdao, China. Hisense USA Corporation offers an innovative range of technology products that disrupt the consumer electronics industry, challenge the competition and provide significant value to consumers. Manufactured and distributed across North America, Hisense USA Corporation's product portfolio includes televisions, refrigerators, air conditioners, dehumidifiers, beverage coolers and freezers. Hisense Company Ltd. is a multinational consumer technology manufacturer and one of the largest television brands in the world and the #1 TV share position in China for 13 consecutive years. The Company is committed to advancing the consumer technology industry across North America and has dedicated R&D centers in Atlanta, Georgia; San Jose, California; and Toronto, Canada to enable localized product development and innovation. Hisense products are available globally in over 130 countries and regions, supplied from production facilities in China, Mexico, South Africa and Czech Republic. Hisense has sales offices across North America, Europe, Australia, Middle East, and Southeastern Asia. In recognition of its strong product offerings, aggressive expansion strategies, global client base and continued investment in research and development, Frost and Sullivan recognized Hisense with the 2015 Global Competitive Strategy and Innovation Leadership Award in Smart TVs.